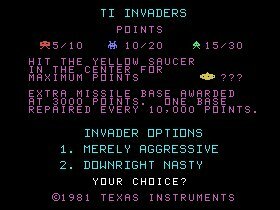 TI Invaders is, in my opinion, by far and away the best version of Space Invaders up until the franchise was truly revisited in 1991. 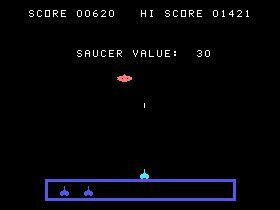 Initially faced with a choice of two difficulty levels (Merely Aggressive and Downright Nasty), the game begins with the standard fare of space aliens, advancing across the screen in their hordes, requiring destruction by means of the missiles dispatched from your missile base. 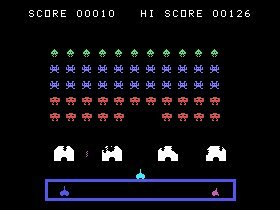 There’s not many games simpler than Space Invaders, and as a result, thoughtful creation of various space enemies combined with pixel-perfect collision detection equals a game with more depth than most clones of the genre. The enemies begin as large red aliens, and progress to smaller and smaller sizes, including some balls that actually disappear save for two pixels that stay visible. Occasionally, a yellow UFO travels across the top of the screen, awarding you a bonus that varies according to where you hit it… hit it dead centre for maximum score! In between each stage there is a “UFO” stage where you must shoot a pink UFO (strangely enough), causing it to dash back across and become smaller. Eventually the UFO is so small it disappears, and this is where timing is crucial. You can continue to bounce the UFO from end to end for as long as you like, providing your timing is amazing. 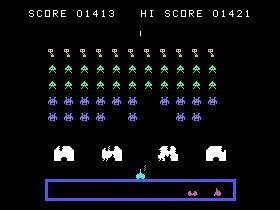 Yep, the game had the simplicity of the Space Invaders we all know and love, the perfect difficulty curve, and, above all, sheer playability. If you haven’t already played this, whether emulated or on the real McCoy, then you’ve missed out, big style. 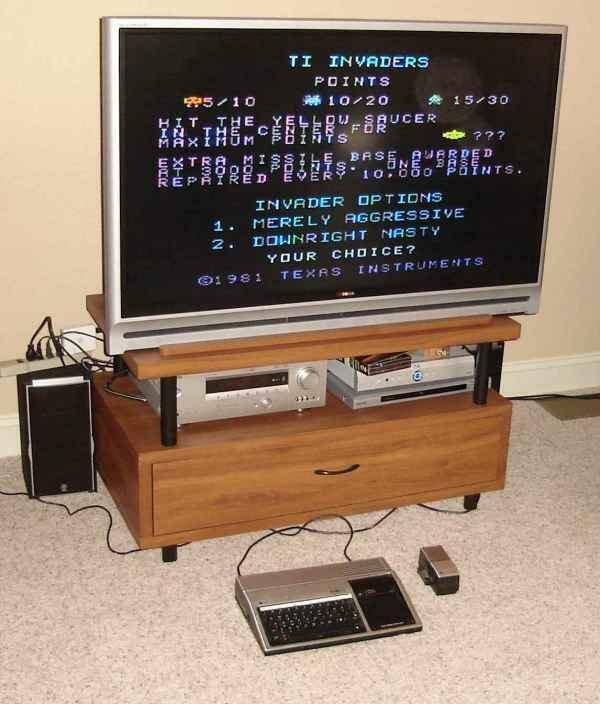 Download it, buy a TI-99/4A on Ebay, steal one from someone you know, do whatever you have to do, just make sure you don’t miss out on THE definitive version of one of the oldest video game franchises of all time. You’ll thank me for it.